In one of the last major events of the four-day World Economic Forum summit in Davos, Christine Lagarde, head of the International Monetary Fund (IMF), led a panel discussion on the health of the global economy in an almost empty hall. Among the other panelists were the World Bank chief Kristalina Georgieva and economics professor Mariana Mazzucato. In a discussion that took in the fight against climate change, the panel also discussed demographic shifts as well as how to encourage innovation and investment to avoid a skills gap that would hurt economies. On Thursday, Lagarde spoke at another event where she warned against Fat Cat pay, telling Davos participants from the financial sector that spiralling executive pay needed to be checked. Before they packed up and readier themselves to return home, the Executive Director of Oxfam International Winnie Byanyima had one last sting in her tail for delegates. In keeping with the theme of global inequality on day four, she blasted world leaders and CEOs for their inaction on wealth inequality. “It’s bad for everyone and we just talk about it. Talking about it is not good enough,” she said. “It’s a result of political choices governments have chosen to make, and we want businesses to commit to good behaviour, not dodging paying their fair share.” She agreed that a universal basic income could go some way to narrowing the gap but ultimately advocated for a wealth tax to help end austerity and fund vital education and healthcare. 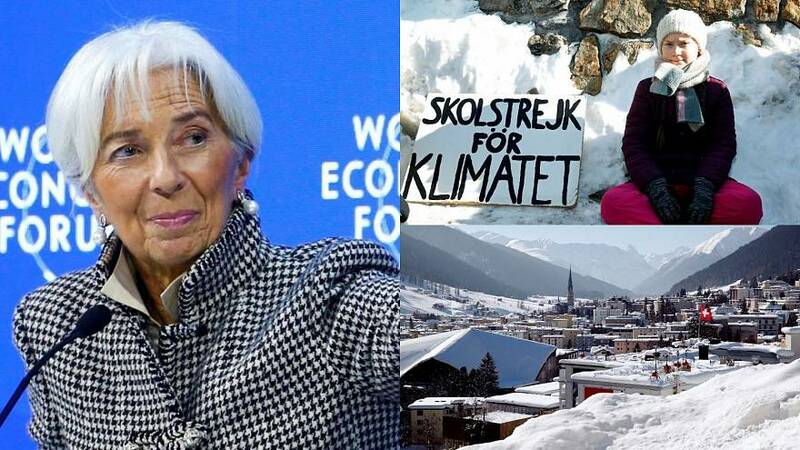 Having already caused a stir on Thursday, Swedish teenager Greta Thunberg joined a panel discussion with Christine Lagarde and WEF founder Klaus Schwab on climate change. The 16-year-old environmentalist was characteristically direct with delegates and media in attendance, telling them “our house is on fire” because of CO2 emissions and rising temperatures. “At places like Davos, people like to tell success stories, but financial success has come with an unthinkable price tag on climate change. We have failed,” she said. At a press conference, she added: “I don’t want you to be hopeful. I want you to panic.” She later joined local youngsters for her ‘climate strike.’ She has been doing her weekly protest outside the Swedish Parliament in Stockholm since September, with a growing number of students worldwide following her example. In a brief shining moment for the UK government representatives, there was a slither of good news regarding Brexit in the dying hours of Davos 2019. Chancellor of the Exchequer Philip Hammond announced on Twitter that he had signed an understanding with the Swiss to ensure mutual market access for insurers post-Brexit. Speaking on the last day of the summit, Hammond also re-iterated comments he made on Thursday at the WEF that a second EU referendum would be disastrous for the UK. He did say, however, that he was confident that a compromise solution would be found on a Brexit deal, adding that a ‘no deal’ Brexit would be a “betrayal” of the British people. In what was the final say on Brexit at a summit where it was understandably a hot button issue, Irish premier Leo Varadkar raised the prospect of troops on the Northern Ireland border in the event of a ‘no deal’ Brexit. In his most explicit warning about the consequences of a Brexit gone awry, he said a hard Brexit would “involve people in uniform and it may involve the need, for example, for cameras, physical infrastructure, possibly a police presence, or an army presence to back it up.” Answering questions at one of the last events of the WEF, he said that Ireland and the EU could work with the UK on a Norway Plus deal or Canada-style package with special arrangements for Northern Ireland. “Ultimately it's the people who caused all this and started this who have to come up with the solutions. We can help,” he concluded. After a busy few days in the Swiss Alps where the political and business elites have grappled with finding solutions to the world’s biggest problems, our correspondents Darren McCaffrey, Isabelle Kumar and Sasha Vakulina sit back for one last chat over coffee to digest the week that was. What were their biggest takeaways from the last four days? Inequality, climate change and the state of the global economy, to name a few, are now high on the world's agenda. • As the WEF wrapped up for another year, attendance figures showed that only 22% of the 3,000 delegates at Davos 2019 were women. Gender balance remains a massive issue for the WEF but the situation has been improving slowly over the last few years. In 2016, only 18% of participants were women, which rose to 21% in 2017. • Swiss pharmaceutical giant Novartis warned that a ‘no deal’ Brexit would harm patients’ well-being because of a potential shortage of medicines. The company admitted it was stockpiling supplies in the UK to soften the impact of the UK crashing out of the EU without a deal in March.